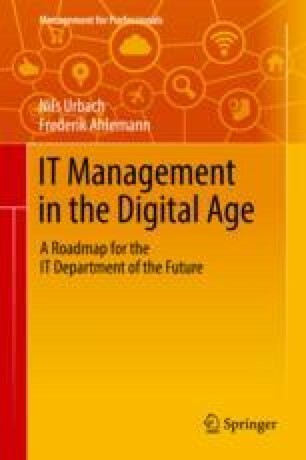 In this book we analyzed the current trend of digitalization. We presented and explained ten hypotheses on the development of IT management, as well as the IT department in companies. Digitalization as a trend is unstoppable and will change many companies significantly. This will lead to new products, services, as well as value creation and business models that we are currently unable to imagine. The effects of intelligent systems that use sensors to perceive the environment, learn independently, and analyze unimaginable amounts of data in the shortest possible time may perhaps be even less conceivable. We must not imagine such systems as only isolated computer system. The special potential of digitalization is that computers interact in a global network. Current IT departments are massively affected by these developments. It is very questionable whether their current organizational anchors, task portfolios, depth of value creation, cultures, and their current cooperation with other business units are suitable for keeping pace with digitalization and taking on a shaping role. Those who do not want to become obsolete by these developments should be vigilant and closely observe current trends, as well as technological innovations. But that by itself will not be sufficient. Structures, processes, partnerships, and also the company culture must be prepared in such a way that rapid, agile action and reaction is possible when business opportunities arise from digitalization or when technologies have attained the necessary maturity. In detail, IT managers can—already at present—take a number of measures to position themselves. These include, for example, the optimization of the IT architecture and its preparation with regard to the use of public cloud services, intensified cooperation with the business units, and the establishment of technology scouting. Successful digitalization projects can be used as success stories to position themselves as competent partners.